Dozens of Albertans took to social media Wednesday evening to report seeing a large fireball in the sky over northern parts of the province. Corbet Kratko was driving near the intersection of Highway 21 and Westpark Boulevard in Fort Saskatchewan when he said he saw the bright light descending through the sky. The maintenance inspector with Alberta Transportation captured video of what appears to be a falling fireball on his vehicle's dashcam at approximately 5:21 p.m. Witness Rogan Hennie told CBC News he was driving north near Lacombe, Alta., around the same time when he saw what he described as "a meteor" in the sky. 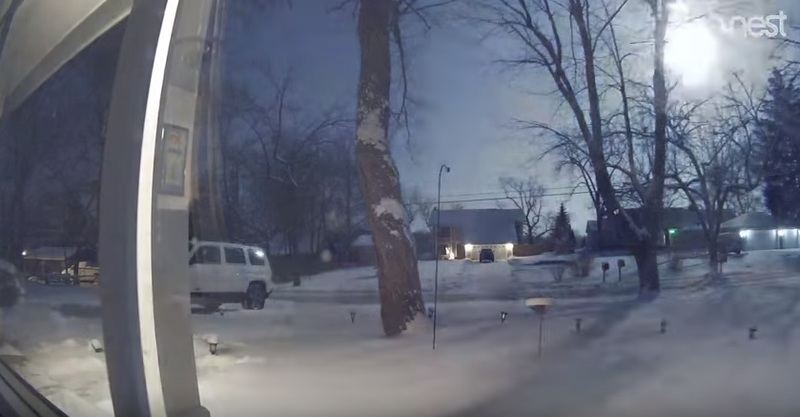 Fort McMurray resident Miguel Borges captured what he said was the flash of a meteor on his home surveillance cameras at 5:22 p.m.
Three people from Alberta and one from Saskatchewan filed reports of fireball sightings to the American Meteor Society between 5:17 p.m. and 5:30 p.m.
MST Wednesday. Chris Herd, an earth sciences professor and curator of the University of Alberta's meteorite collection, told CBC News that fireball sightings can be reported to the American Meteor Society or the Meteorite Impacts Advisory Committee. The USGS claimed an explosion caused by a meteorite exploded with enough force to register as a magnitude-2.0 earthquake over New Haven Michigan on Tuesday. The meteor was seen across the region in places such as Ohio, Michigan and Ontario at about 8 p.m. local time and registered a 2.0 magnitude tremor about 4 miles (7 km) east of Saint Clair Shores in Eastern Michigan, the United States Geological Survey said on its website. The National Weather Service (NWS) confirmed it was not a meteorological event but more likely a meteor.